I rarely update previously published posts, but I wanted to let those of you in the Chicago area know that Sophie Hannah will be at Anderson’s Bookshop in Naperville on Sunday, August 11! Click here for more details. Charlie and Simon’s relationship takes a back seat to the suspense, although there is a big reveal about how truly freakish Simon is (although lovable, of course). In the forefront is a woman with a problem. Amber Hewerdine cannot sleep. Twenty minutes here, thirty minutes there, sometimes as much as an hour if she lies down in somebody else’s home. And the insomnia has been going on for months – it’s to the point she’s thrown away all her pajamas and is no longer even lying down at night. Eventually, she’s so desperate she makes an appointment with a hypnotherapist. It’s a coincidence that she encounters Charlie Zailer waiting outside; Charlie has her own reasons for seeing a therapist. Charlie’s making notes in a notebook, they chat, and Amber heads inside for her session with Ginny Saxon. The book benefits from wonderful, strong characters. One is therapist Ginny Saxon, who plays an especially important role in explaining the psychological foundations of the characters and their behavior, and another is Amber, who suffers so mightily and so bravely in order to safeguard her family, in more ways than one. The people and the plot are so compelling interwoven – and Hannah does such a wonderful job of peeling back the layers of both – that the reader is swept along. The “who-done-it” part is resolved sooner than the “why-was-it-done?” It’s a neat and satisfying ending. And, of course, Amber can finally get some sleep. Final verdict: Big thumbs up on Kind of Cruel. Having read several in the series, I would recommend reading them in order – I must have missed one, because I was a little out of step with Simon and Charlie – but it’s not absolutely necessary. And I sincerely hope that we’ll be seeing more of Ginny Saxon. 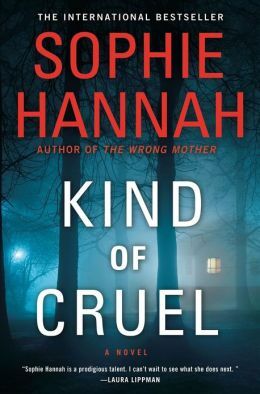 This entry was posted in Commentary, Review and tagged Charlie Zailer, Kind of Cruel, psychological crime novel, Simon Waterhouse, Sophie Hannah. Bookmark the permalink.